A Great Way to Tour Cape Cod and the National Sea Shore! As you round Provincetown and traverse the canal, you will see Cape Cod Bay's abundant marine life, the beautiful dunes and birds of the Cape Cod National Sea Shore, and historic Buzzard's Bay. Leave Scituate Harbor and travel through Stellwagen Bay National Marine Sanctuary. See massive freighters in Boston's busy shipping lanes, lobster men and fishermen plying their trade. As you round the cape you will see Provincetown, famous Race Point Light and miles of dunes of the Cape Cod National Seashore. Visit Hyannis for Lunch, Woods Hole harbor, Naushion Island (owned by the Forbes family), Hadleys Harbor, Buzzards Bay and Cleveland Ledge which was named after President Grover Cleveland who fished there often. 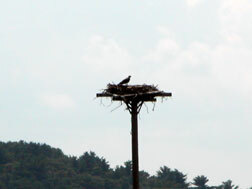 See whales, seals, and other marine life on your tour, including this osprey's nest. 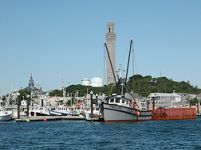 Navigate the Cape Cod Canal, pass America's home town of Plymouth and then a straight shot back to Scituate Harbor passing the famous hurricane-created inlet called the North River.